With a growing number of providers offering online streaming options, more and more people these days are realizing that they don’t need to spend a lot of money each month to get cable or satellite TV. Still, there are plenty of good things available from television stations which don’t require a cable account. An old-school antenna can provide you with plenty of entertainment options, and also allow you to catch local programs that you might otherwise miss if you just look to the Internet for shows. Best of all, once you have it installed, an antenna gives you the programs free of charge—no cable or Internet bill required. Here’s how you can find the best antenna for your home. Multidirectional: Multidirectional antennas are designed to pick up signals from different directions at the same time. Single direction: Directional antennas allow more focus—they pick up programs that come from one direction. 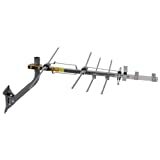 HDTV: These antennas are designed to pick up high-definition broadcasts. Range: When you’re researching antennas online, be sure to check out their effective range—that way you’ll be sure to pick a model that can pick up the highest number of stations in your area. 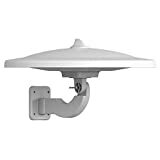 Mounting: Most antennas are designed to be installed outside, either on top of or next to your house, but some models can be installed inside. 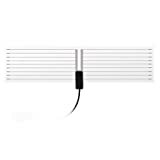 Before you buy an antenna, make sure that it will be a good fit for your home setup, and that you have all of the equipment to put it together once it arrives. Signal: If you live in an area that has weak broadcast signals, or if you’re far away from towers (you can look this up online in a lot of cases), then you might want to buy a boosted antenna. 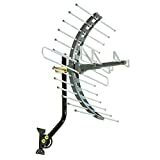 Similarly, if the local broadcasters offer high-definition transmissions, an HDTV antenna could be a smart investment for you. Range: Even if you live in an area that has a number of broadcast towers, you’ll still want to look for an antenna that has a large effective range to maximize the number of channels you can choose from. Your area: When deciding between, say, a directional or multidirectional antenna, it’s important to think about the area you live in. For instance, if you know that most or all of the available broadcasts come from one direction (you can find that kind of information online in many cases), then you might be best served by purchasing a good, strong directional antenna as opposed to a multidirectional model. 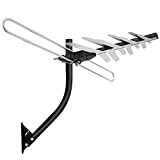 Signal type: If you have a high-definition television, then it will probably be worth the money to purchase an HDTV antenna. If you have an older model—or you know that there aren’t too many HDTV broadcasters in your area—then you probably don’t need to worry about purchasing an antenna that can receive that kind of signal. 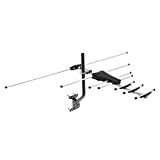 Mounting equipment: Before purchasing an antenna, be sure to take a look at the kind of equipment you would need to install it at your house so that you can be sure that you have (or at least have access to) the necessary tools, equipment, and other materials necessary to get the job done. 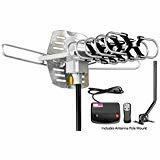 Antennas Direct: Antennas Direct is an American company that sells a variety of television antennas and accessories directly to consumers and installers via a number of online retail outlets. SF Cable: SF Cable is an American company that specializes in electronic power supplies, networking accessories, and other electronic equipment. RCA: RCA has been one of the most well-recognized names in electronics. Its brand is associated with a wide range of excellent electronic equipment and accessories. 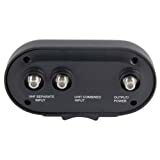 Winegard: Winegard offers a variety of antennas and accessories for use in homes, recreational vehicles, and outdoor events. Channel Master: Channel Master is an American company that has been offering television accessories since 1949. They offer a range of products, including antennas, signal amplifiers, and recording devices.